Mary Cohr Facial, Age Repair helps to fight against signs of ageing. Mainly focuses on Dermabrasion, which uses an abrasive scrub to remove the top (superficial) layer of skin. Intended to diminish appearance of acne scars, black heads, white heads, etc. The last step is a simple sheet mask which is infused with pro-collagen, which will help stimulate the repairing process of the skin. 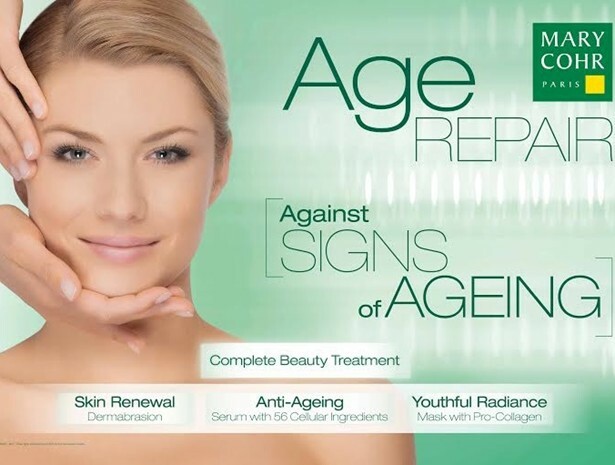 Mary Cohr, Age Repair Facial gives a more youthful, radiant, refreshed look, with less wrinkles and more even texture.